All transactions are safe and secure with a reliable history in online purchasing behind each of our associates. Buy the Too Close for Missiles Switching to Guns t-shirt to own Top Gun clothing and merchandise. This Maverick movie quote Top Gun t-shirt displays a humorous design on the front, which features the F-14 Tomcat pilot's quote. Two arrows emerge from the sides of the Maverick Top Gun movie quote, "Too close for missiles, switching to guns." The text on the tee is printed in white and red. Wear this tee with a pair of cool Top Gun sunglasses and you'll be feeling the need for speed in no time. Match your outfit with one of the Top Gun hats below. 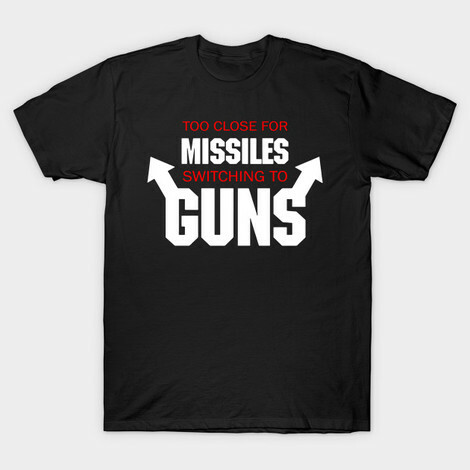 In addition to the Too Close for Missiles Switching to Guns tee above, browse the Top Gun Clothing Gallery for more apparel like men's and women's clothes, kids shirts or hoodies.